Qlik Web Connectors is a web service with an easy-to-use interface, that offers a simple way to connect to over 40 different specific services with Qlik Sense/QlikView. Several of the standard service connectors come free to use, while others are considered premium service requiring a licensed subscription. A handful of the connectors are currently available free to use during beta testing until Jan 31, 2018, so we decided to try one out (the JIRA web connector). JIRA is an issue and project tracking software tool utilized by some software development companies to track workflow. We decided to give this connector a shot, to both evaluate the tool and see what insights could be gained, if any, from our own JIRA dashboard. 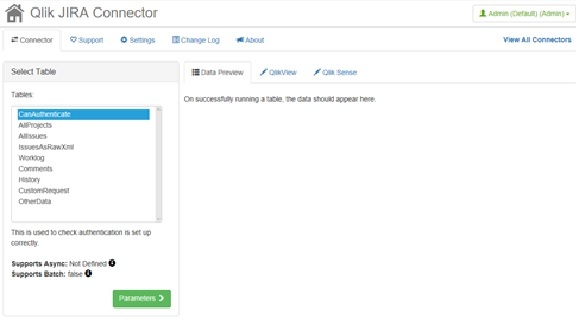 Qlik JIRA Connector is a straight-forward connector that contains several tables with which to query data from your JIRA. Using a simple dropdown and set of basic parameters (URL to your JIRA site, username, password), I was quickly able to connect to my team’s JIRA site and begin pulling in data. The most useful table where I discovered the bulk of the information to be was the ‘AllIssues’ table. Everything a JIRA user would need to see was located here from: story points, sprints, issue names, user assignees to reporters, etc. I found this to be a huge plus for its ease of use and setup. The one downside I encountered was there were several fields titled ‘CustomProperty#’. Story points (which is a key element of JIRA) I found buried within one of these custom property fields and had a difficult time tracking down the exact field. Through a lot of side-by-side comparison however, I eventually deciphered which fields most of the CustomProperty’s represented within JIRA. This may not be the case across other Jira sites, but we will see as we work with other Jira sites for our clients. 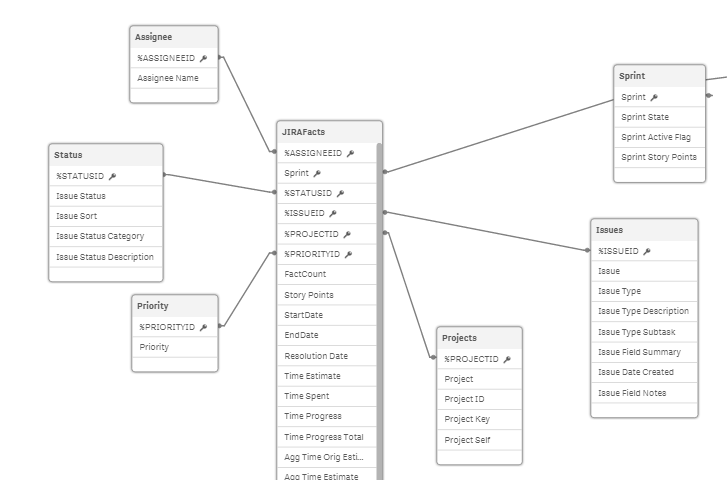 Soon enough, I put together my version of a JIRA star schema and was pulling information like the number of unique issues within our JIRA, followed by a breakout of tasks by type. Eventually I made the discovery that we have a lot of unresolved issues…a pretty basic insight, since this was an expected outcome from an infrequently used JIRA site. I continued creating a few high level KPI’s and bar charts with information that any JIRA user would understand such as issues To Do, In Progress and Completed, Active Sprints, and Issue Priority. It was quick and painless to recreate most of what the JIRA dashboard already offers from a factual standpoint, but I soon tried to imagine what, from an analysis standpoint, it was lacking that Qlik could provide. Putting myself in the shoes of a project manager, I would want visibility on not only how a project is doing, but also a retrospective on how the project did. If the project failed to meet certain deadlines, what are potential causes of falling short on target goals? Things like Issues created during a project start, or under/over utilization of team members are factors we could now analyze. It becomes quickly obvious now where inefficiencies may be. Surprisingly, in three instances I discovered issues for projects that were created after the end date of that project had passed. Overall, the JIRA connector for Qlik Web Connectors is an intuitive tool that I could see being useful for a project manager/team to gain a better understanding of their project activity and analyze efficiencies that the standard JIRA dashboard may not provide.